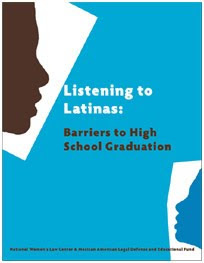 In a new report “Listening to Latinas: Barriers to High School Graduation” was released August 27 by MALDEF and National Women’s Law Center highlighting the greater challenges Latina students face than their counterparts. The report is meant to offer strategies to get young Latinas to graduate High School. The latest data show that 41% of Latina students do not graduate on time with a standard high school diploma. The study reports that while 98% of high school seniors want to graduate from high school, and 80% aspire to higher education, Latina students continue to face numerous challenges in reaching these goals. Improve efforts to prevent teen pregnancy and provide support for pregnant and parenting students, and require better data collection and promote school accountability. Together we can improve the quality of life for Latinas by reaching out to our community and encouraging them to stay in school. Irasema Gonzalez and I are proud to say that we’ve had the opportunity to mentor some amazing young Latinas who are the next wave of Latina leaders in the city and they include Mayra Macias and Zulema Ortiz. For more information on this report, visit MALDEF.org.